The 1st U.S. Circuit Court of Appeals is weighing in on a request to reinstate a lawsuit accusing Maine Gov. Paul LePage of abuse of power and blackmail. Lawyers for Democratic House Speaker Mark Eves and the Republican governor delivered arguments Wednesday. Now the three-judge panel in Boston will decide whether to overturn a decision by a federal judge in Maine to dismiss the lawsuit. Eves' lawsuit accuses LePage of using blackmail to force a charter school operator to rescind a job offer to him, and seeks unspecified compensatory and punitive damages. His lawyer, David Webbert, said the lawsuit aims to protect Mainers from being "blackmailed, threatened, and intimidated by a politician willing to abuse government power for partisan reasons." LePage's lawyer, Patrick Strawbridge, had no comment. Gov. 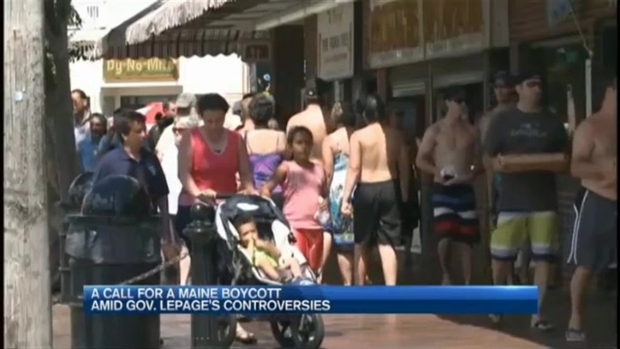 Paul LePage's recent controversies could be costing Maine money, now that several tourists have cancelled trips to express their disapproval.